Making a payment for a single invoice is easy. But what if you want to make a payment for several thousand invoices? How do you show the remittance information? If your vendors and trading partners accept CTX formatted ACH files, ACH Universal™ can help you easily create one payment - and have it contain the electronic remittance information for thousands of invoices (up to 9,999 lines of data). 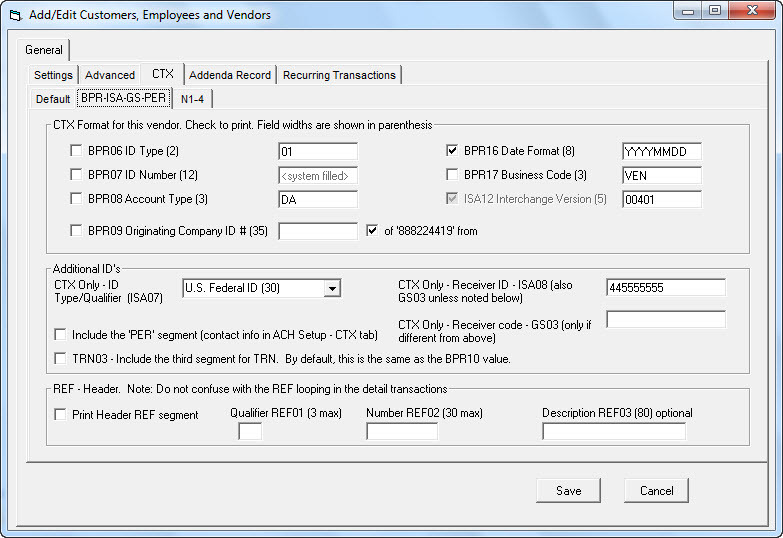 By default, all EDI transactions are formatted in accordance with the de facto industry standard: the EPN STP 820. The EPN STP 820 transaction set is a standard developed by the Electronic Payments Network, a division of the Clearing House. With ACH Universal™, you have full control of every field in the ACH-NACHA formatted file. We provide comprehensive default features and fields that you can use -or override- at any time. In addition, you can easily create profiles for your trading partners and vendors that store detailed information - similar to a payroll package's employee profile containing the name, address and tax information. The Corporate Trade Exchange format supports transferring of funds within a trading partner relationship utilizing a full ANSI ASC X12 message, or when payment-related UN/EDIFACT information is sent with the funds transfer. Multiple addenda records contain the ANSI or UN/EDIFACT information. Do some of your vendors want detail, where others don't? Need to transmit to a utility company on version 3030, but everyone else wants a current version? Totally redesigned from the ground up - our new CTX engine is based on vendor - and is not set globally. This provides you with total segment control. Note: Upgrades - With the introduction of our new CTX engine in version 10.12.3 - you cannot upgrade an old database with the new version. However, you can run both your old and new versions concurrently without any additional licensing requirements. Your old data will always be available in your earlier database/version - and you can enjoy all the new benefits in the new database/version. Call Treasury Software support for additional information.